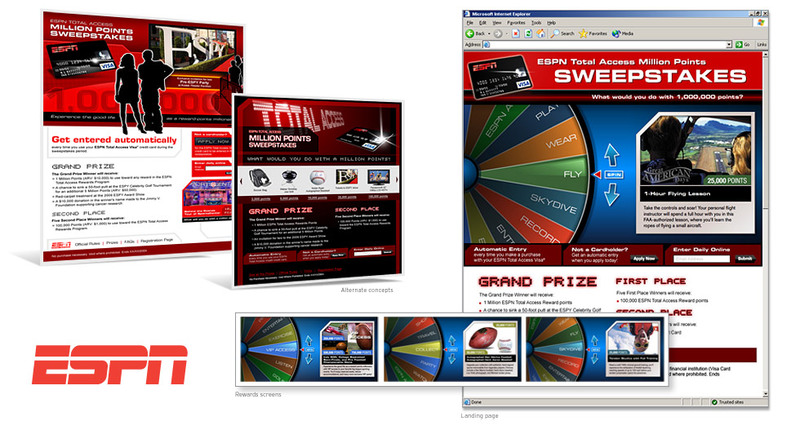 Interactive Flash interface created for ESPN Total Access Million Points Sweepstakes promotion. The chosen concept featured a prize wheel that visitors could interact with in a variety of ways to discover some of the experiential rewards sweeps winners could redeem points for. The wheel had a realistic “feel” complete with synchronized sound and lighting effects. Art direction and lead visual design included concept and storyboards, copy writing, Flash and HTML development, audio recording and post-production.